BU just has trouble getting goals. 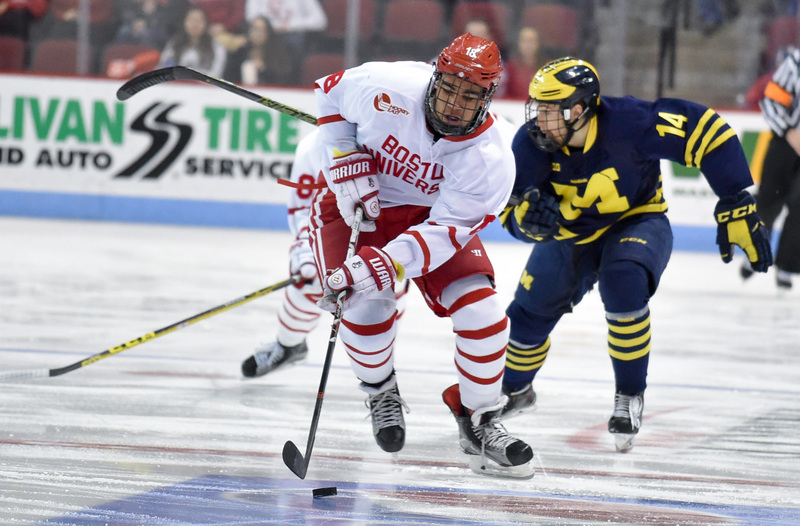 I think it is time to realize that there will be no NCAA run this year and we only have the Beanpot to look forward to going forward. Why does Grizz take so long to get healthy ? Pros will not let him get away with this stuff. BC had three guys out two days ago and still led 3-1 to ND late in game. They have guys that can score. We can not seem to find same in any quantity save for the Eichel exception and we had him for only one year. I don’t understand your question about Grizz. He has a knee injury. Often times you’re out the whole year and then some. What does that have to do with the pros? I think what’s frustrating is that from the day this injury happened, the post-game announcement indicated that he might be able to play the next game (which I think was a few days later). So, at this point, it is disappointing that he has missed this many games. What I definitely DO NOT want is for this to be handled the way many of the morons who run pro football teams make their player decisions … and bring the athlete back when he is not fully healed and then we lose him for the rest of the year. On a final note … I believe that it was announced that Grizz had a setback in practice earlier this week. Exactly what the setback was and the seriousness of it … is something that is not public information. I was happy with the way we stayed right with them. I thought we had about 6 grade A chances that we could not score on. That being said the game down to the play of the goalies and Yale won on that front. Another disappointing defeat. A new lowlight after playing Yale even for 38 minutes a questionable and ill fated timeout turned a potential victory into a defeat. I wonder what was discussed during the timeout. Perhaps it was post game dinner choices or which movie to watch after the game. It certainly was not game strategy as not one but two goals were scored in less than two minutes. No defensive coverage off the face off and one of the dumbest penalties of the season cost BU. the game. Totally unacceptable in high school never mind college. They beat themselves and deserved to lose. Where is the accountability for this continued undisplined play that is ruining the season ? That being said I hope they take a look in the mirror and come together to pull off a major upset tonight ! Larry,Larry,Larry,we have been getting along well lately and I am not going to let that change.We are talking about Yale,perhaps the best goalie in the Country,and our team is depleted with injuries,no excuse,fact.Anyway,I agree about the trend of ridiculous penalties we are taking,and the Coach on “training Wheels” can’t bench them,because he has no bodies to replace them.Anyway,lets hope for a W at Q….. I haven’t been on this blog long,but why is Larry always taking shots at the coach?It seems to be a trend,which is his right,but I don’t see anyone else doing it as often.Perhaps he wanted Bavis to get the job?I don’t know,but it seems he takes pleasure in doing so….just an opinion…tough loss against a very good team at home. Nothing personal Larry,just an observation,I have enjoyed our conversations…. I wholeheartedly agree Guest 22! He clearly doesn’t like Quinn, (stupid snide comments about dinner choices and tanning…so childish) and good point about Bavis. Totally forgot about that. He is a HUGE parker fan so maybe he thought Bavis should’ve gotten the job? Who knows but anyway, I think Quinn and Co (Scott Young HUGE pick up on the bench this year!) will bring home a few Titles before his time is up. HUGE WIN OVER QU tonight!!! GO BU!!! We beat the Q,gave them thier first loss,and our Q,Certainly had absolutely nothing to do with the win,right Larry?I am joking around,good win,just what they needed!!! It wasn’t the timeout that caused the goal, but rather the failure of #8 to get in front of the Yale point man and deny him a shooting lane. It also looked like #16 lost his balance on the initial shot and wasn’t able to tie up the man who converted the rebound. It was the execution, not the strategy. Questioning the timeout is just exercising your cranky, Larry. Larry just likes to bash Quinn &co every chance he can get. One can almost hear his joy in his ridicule. Now it is disappointing to see the losses add up. They need to get back to basics and play as a team. Follow up at the net after shooting. Gonna be a tough one tonight. I agree with SoCC . Grizz took weeks to come back from an injury last year. When one is not done for the season it is usually a sprain. Two to three weeks max. I remember when Eichel came back from Jr’s last year and was available but given a day “off”. These guys are babied way too much and it shows from their lackluster performances in many games this year. Yes I am cranky after the team gave the game away. A bad mental error and a continuation of undisplined play are not good reasons to lose games at this level. I thought the timeout was to go over assignments and strategy not to take the post game pizza order. Please, all you excuse makers, injuries are part of the game and not the reason for last nights defeat. Talent is not an issue, however execution and focus continue to be major problems. If you play smart fundamentally sound hockey and have solid special teams, BU only needs to score three goals a game. I agree with your assessment of the defense. Correctable mistakes repeated over and over again. Walter – could you please tell me the nature of Eichel’s injury when he returned from the world junior championships last year??? Glen he was given a day off bc the coach cares about the kids are humans and not just hockey players. Walters comments are ridiculous. He must cohabitate with Larry. Fact: Eichels father thanked quinn for resting his kid, who was 17 yrs old by the way. Imagine the uproar if he got hurt during that game? Quinn would’ve been bashed for that too. Some “fans” will never be happy. Perhaps they forget not even the great jack parker made the pkay offs,every year. Hi Sarah, Judy and Andrew. Look out for me tonight. I will be at the game. Glen: HE HAD NO INJURY. Proves my point . Your point is moot. They made it to the finals even with sitting Eichel that game. Move on. Stop being so thinned skinned and sensitive about my comments. My constructive criticism is more than warranted. Especially since B.U.makes the same dumb errors game after game. It is now almost half way through the season and enough is enough, Perhaps you just cannot handle the truth. Tell me where specifically I am wrong or I even mentioned your buddies name I commented on the game and its results. If theywin tonight I will praise the team with no criticism . If not well I will state my honest opinion. Ayyyyy least be honest larry…you can hate the coach and all he does its your right. And i can respect him and say so its my right. I do respect your opinion and your rights but I don’t hate the coach. I agree I am not his biggest fan. I am very frustrated by the team and its record. I expected much better results. I honestly hope they win tonight. Seems like hate to more than a few bloggers Larry,I do not think that,but am starting to lean towards that thought, I hope I am wrong,GO BU! Walter – Are you saying that Grzelcyk’s knee injury shouldn’t be taking this much time to heal? If so, what’s the basis for your opinion? I have enjoyed debating our different points of view. It would be sad if everyone one agreed on every topic. Go Pats tonight and Happy Holidays ! I am tough on all coaches of teams that I support. Constructive criticism and not agreeing does not mean I do not support the team. I am not the coaches biggest fan for the reasons that were recently posted by another blogger this week. It has more to do with off ice issues. If you think I am unfair or incorrect please give me specific examples. I get very frustrated when they lose. Congratulations to Coach Quinn and the B.U. Hockey team for last nights victory against the undefeated and #1 ranked team in the country. Job Well Done ! A nice way to end the first semester. This was a much needed win and hopefully Grizz, Olson and Ahti will be back for January and we can continue with the W’s. Same to you and your family ! I almost forgot to mention how happy I am for Sean McGuire. It looks like he has completely recovered from his injuries. Solid goaltending will win many games. Way to go Mcguire!!! Thought I was watching a replay of a game from his Freshman season. That type of play is a game changer. Makes up for goal scoring issues. Yes indeed Ozzie. Do you remember the last game of that season? The loss against Lowell at TD Garden? That was a mind-blowing performance. Too bad we couldn’t score a goal that evening. Then again, they had Connor what’s-his-buck between the pipes.